Typing on a phone isn’t the best experience, but with a plethora of keyboard options available, everyone should be able to find something that works for them. On Android, I generally bounce around between GBoard, Grammarly, and Fleksy. The weirdest part of this is that I test each of those keyboards on different phones and I find different phones work better with different keyboards. Fleksy is available on iPhones as well, but generally, I don’t use third-party keyboards on iOS. For me, there’s no one keyboard to rule them all, but when I use a Huawei P20 Pro, Fleksy works the best for me. It fits the screen size nicely plus it has a few tweaks and personalization options. The keyboard actually holds the Guinness World Record for fastest keyboard, so if you get good with it, there’s potential to fly through your sentences. It also values your privacy and has a separate app for the private sector. For everyday users, the more interesting aspect of the keyboard is the visual customizations. Flesky offers a handful of free keyboard themes, and then there are even more that are available to purchase. The Chameleon theme changes the appearance of the keyboard based on the app that’s being used, and it’s priced at $4.99 CAD. In Spotify it’s green, red in YouYube, yellow in Keep Notes and so on. This tweak isn’t for everyone, but it’s really cool and adds delightful pops of colour throughout the operating system. 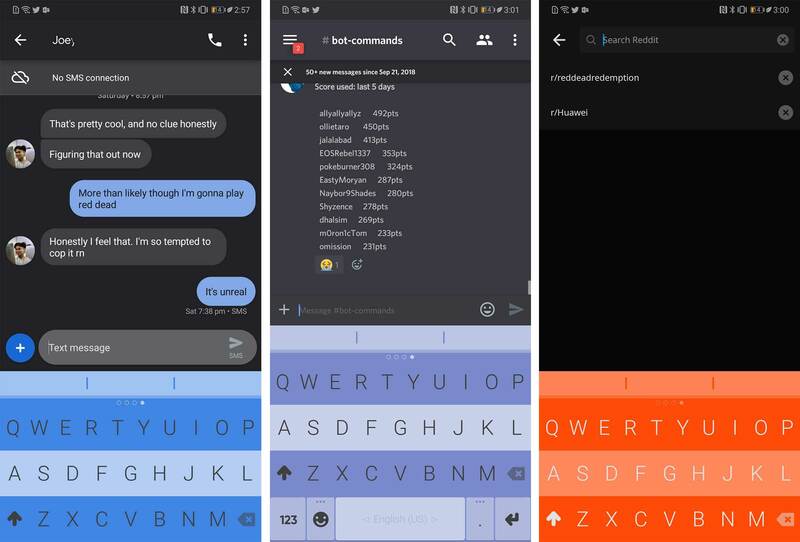 For users that don’t want to pay, Fleksy has a great theme editor that gives you tons of control over the colours in every aspect of the keyboard, right down to the button shadows. 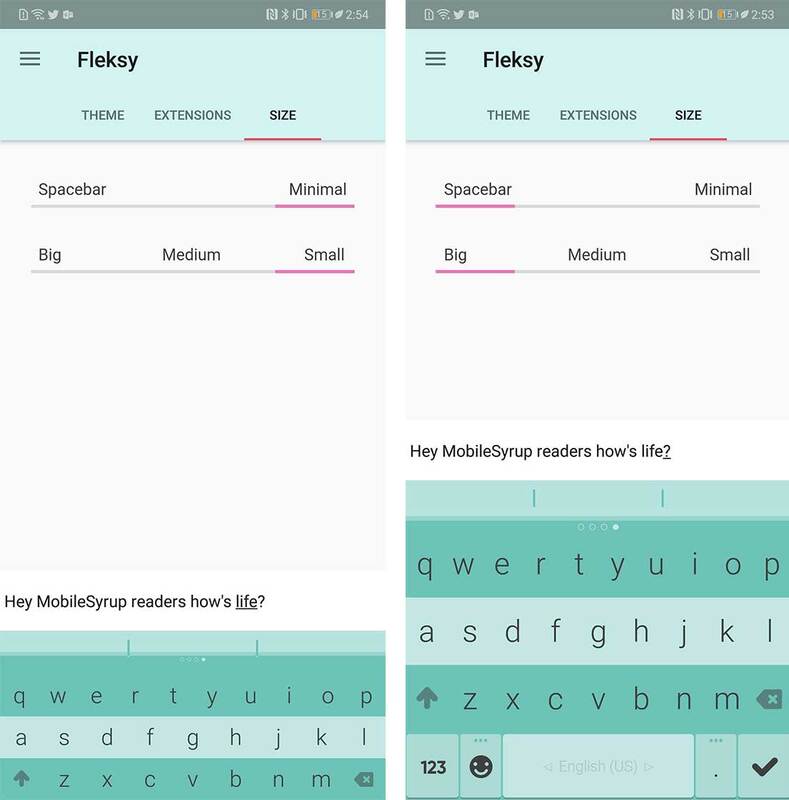 Fleksy can be used in a bit differently than a regular keyboard for adventurous users by getting rid of the spacebar, but there is a traditional layout as well. The non-standard keyboard is called the Minimal keyboard and it gets rid of the space bar and replaces it with a swipe gesture. A single swipe for space and a double swipe for space plus punctuation. Gestures are a pretty big part of the Fleksy experience. Swiping up with two fingers expands the keyboard to include the spacebar, enter key, emoji button and number pad. As you type – in either minimal or regular mode – Fleksy offers predictions in case you make a typo. Once the word is complete, it arranges these predictions into a list along the top of the keyboard. Swiping down on the keyboard filters through the list until you land on the word you were attempting to type. If the word you wrote isn’t in the dictionary, like product names, you can swipe up instead to save it to your personal Fleksy dictionary. Finally, holding down on the keyboard quick switches to the numbers and symbols screen to make it easier to type things like colons, brackets and numbers on the fly. 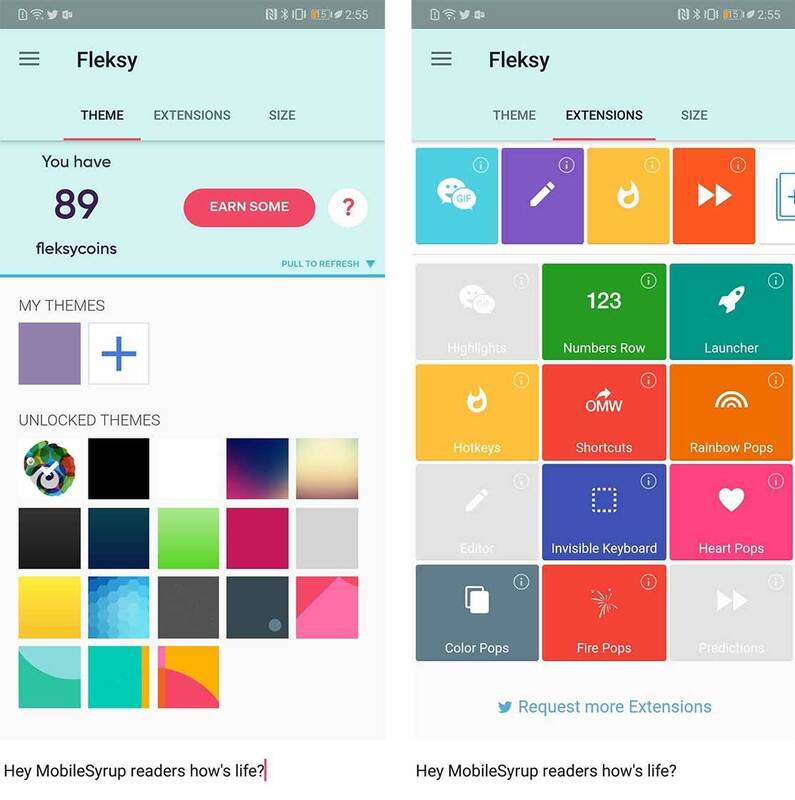 Fleksy also has a section where the user can rank up by completing Fleksy challenges. These challenges range from tasks like type 100 emoji to swiping for over 1000 yards. Completing challenges earns you badges and ‘flekscoins.’ These coins can be used to buy more themes, but it does take a while to earn enough to afford anything. The keyboard also has a handful of extensions like a GIF search bar, an editing tool, app shortcuts and more. Overall this is a great keyboard, but in my opinion, it doesn’t work as well on every phone. For some reason when I use it on my other Android phone (OnePlus 6) the swiping to space feature doesn’t seem to work as well on the Huawei P20 Pro, which is frustrating. 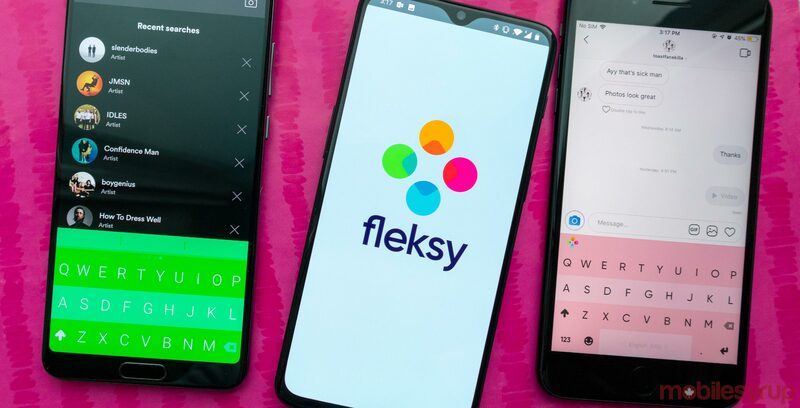 You can download Fleksy on iOS and Android for free.